When the District of Tofino dedicated November 'Oyster Month', it was a sure sign that the Clayoquot Festival of Oysters and the Sea was a huge success with many more years of celebrating to come. 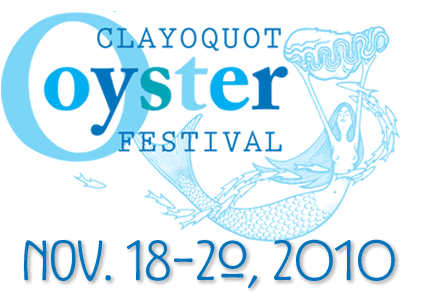 This year we celebrate the 14th Annual Clayoquot Festival of Oysters and the Sea!! What was once a humble locals event for one night; something do to on a rainy night in our once sleepy November town, has now evolved into a weekend of oyster gastronomy, including oyster farm tours, educational seminars, masquerade ball and of course, the main event, selling out in just four hours after tickets went on sale this year, the Oyster Gala. There are plenty of other events to go to November 15th - 17th. If you are dining out around town this month, ask about special oyster features. Otherwise, slurp into the mood and find your own way to celebrate 'Oysterember'! The Mermaid's Ball is a costume party themed 'Under the Sea'. Wine and beer tasting from 9:00 pm - 9:30 pm accompanied by raw oyster bar and bbq in the pit! Great prizes for Best Male Costume, Best Female Costume, Best Couple Costume and Best Oyster Slurper! Door pizes too! The Oyster Gala, an outstanding grand finale, will wrap up the weekend on Saturday night. Oysters any way you like them, wine, slurping, dancing and more. Local restaurants compete for Best Oyster prizes in various categories, including ballot entries for People's Choice Award. BC wine, beer and cider will be featured. The Tofino Oyster Festival is celebrating its 14th anniversary in November 2010. The festival includes oyster farm tours, educational seminars, the Mermaid's Ball, and of course the ever popular Oyster Gala.